As all good Sibes know, quality transportation is very important. We have had many vehicles over the years, but have recently traded in our Nissan Xterra. Absolutely great vehicle, but at around 140,000 miles, it was beginning to show its wear. I am sure transporting Sibes in it had nothing to do with the wear. Amazingly, Sibe hair does not reduce the trade-in value (but I do feel sorry for the guy who has to do the detailing before resale). 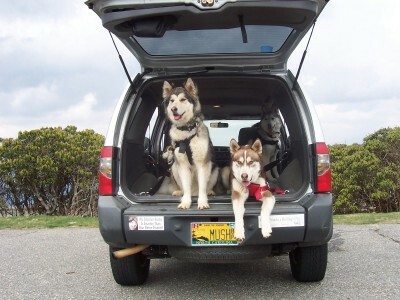 Rusty is on the left (looking out the window), then Kiska, Kodi (hanging out in his usual goofy fashion), and Natasha in the far right. 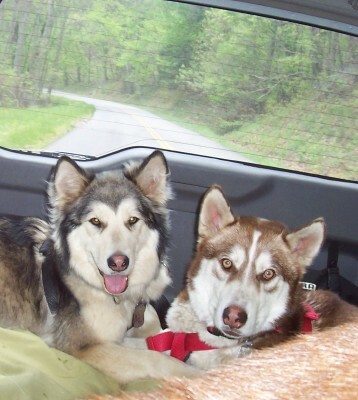 Riding down the road and Kodi discovers Kiska makes a great pillow. So we finally broke down and replaced the Xterra. Years ago, as a teenager, I was able to drive a Toyota Land Cruiser (the old style, not the fancy new things) for several summers in a summer job. It was, hands down, the coolest vehicle I have ever owned. 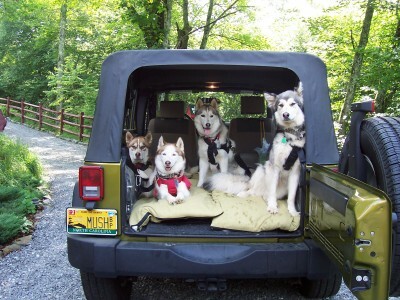 Maybe it is a midlife crisis, but I have wanted very badly to own a Jeep Wrangler. With the new longer wheelbase (and, thus, cargo area) on the Unlimited, I finally had a Jeep to play in that could also transport The Thundering Herd. And, so, we unveil the Herd in their new ride. Errrr – Needing to add Qannik. Picture at Craggy Gardens. 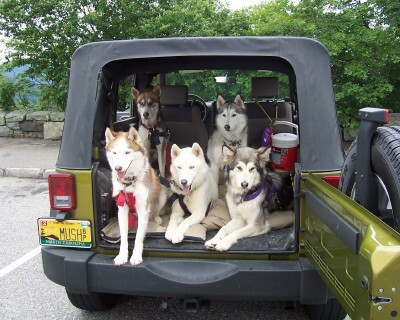 Yes, the dogs are all wearing harnesses which are connected to the frame of the Jeep (and was to the Xterra). These are dog seat belts that keep the dog from leaping out of the car, but also, very importantly, protect the dog in the event of an accident. Mine come from Champion Canine Designs. I don’t receive any compensation from them, but want to make sure that dogs are not harmed in an accident. 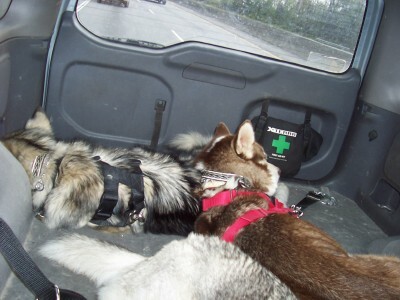 Please use either a harness like this or a crate when transporting dogs. A dog leash to a collar will NOT work in an accident.